A new line of stirrers with accurate control for precision research and power for high volume/high viscosity lab or pilot plant applications. The heart of this line is the microprocessor controlled, high performance brushless direct current motor. A unique two speed transmission transfers the motor's power to the chuck with 95% efficiency, providing incredible amounts of power. If maximum torque is exceeded, the stirrer will automatically shut-down and an LED light will signal an overload condition. The user friendly keypad displays RPM and torque and allows for precise speed adjustment. 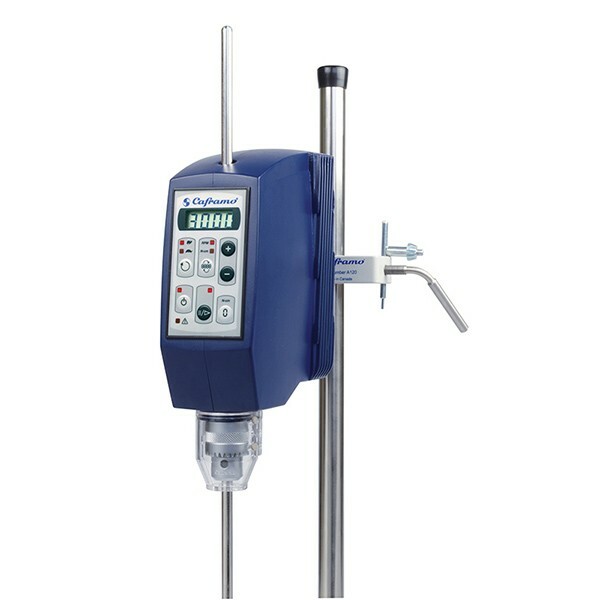 These stirrers also maintain the set speed as the solution's viscosity changes. Totally enclosed non-ventilated rugged metal housing, ideal for continuous use. A hollow through-shaft allows for varying shaft length and impeller depth. All units complete with chuck, chuck key, support rod, power cord and 2-year warranty.